Have you seen my review of Miriam Kosman’s new book about Jewish feminism in this week’s Jewish Home L.A.? 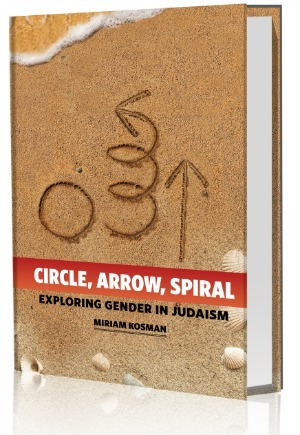 This week’s Jewish Home L.A. contains my review of Circle, Arrow, Spiral: Exploring Gender in Judaism, recently published by Mekor Press and distributed by Menucha Publishers. Miriam Kosman‘s new book appears at a pivotal point in Jewish history. The role of women in Judaism has dominated the headlines of Jewish media outlets in recent years. Usually, Hareidim are made out to be the bad guys: according to most writers, Hareidi men bully women, look down on us, and short change us in any way humanly possible. For someone like me — a feminist who willingly joined the ranks of those observant Jews who lean to the right — this kind of “news” makes us want to bang our heads into the wall in frustration. Not only do we perceive the Jewish world differently, many of us chose Orthodoxy in some part because mainstream feminism had failed us. Frankly, we felt more supported and appreciated as human beings, as Jews, and as women within our new community than we did in in our former, non-Orthodox world. We feel respected by the vast majority of Hareidi men, including by our husbands, sons, and rabbis. And while we do see plenty of areas in which our community can and should improve, many of the issues targeted by reporters and crusaders hold completely different meanings for us than for secular people. Many of the recent books about Judaism written by Modern Orthodox authors have compounded the problem. They report on our world as outsiders (sometimes trumpeting all along how because they are, loosely-speaking, “Orthodox” they therefore have an insider view), and often articulate outrage while playing fast and loose with facts. Yet, until now, few books for the English speaking world have expressed the genuine insider perspective as to why Orthodox women don’t participate in many time-bound positive commandments, are excluded from certain communal rules, and so on. Miriam Kosman‘s new book remedies that. You can find my review of the book here, on page 20, and I highly recommend it to anyone curious about the role of women in the Orthodox world. Even for someone like me who has studied the subject and lives an Orthodox life, I found surprises, yet the non-Orthodox — women and men — will be able to appreciate it as well. Have you read this book? Do you have another, favorite book about women in the Torah world? Share a comment! Just in the print edition..
We’ll also be making a bar mitzvah in less than a year, and the mechitza will be much discussed, I’m sure. 🙂 One of the things I liked about the Miriam Kosman book, by the way, was that a lot of the concepts were really applicable not only to the non-Orthodox, but to non-Jews. I don’t think it’s the last word on the issue, but before the Kosman book, almost anything in-depth I’d seen about Orthodox feminism was in the form of a class, in person or online, not in print (for example, there’s a great online class about a lot of the same material covered by Miriam Kosman in one of the early chapters that’s by Rabbi Shais Taub). Usually these lectures just addressed a single topic…this book really hits a lot of major issues and approaches in a single volume, which can be read at leisure and shared, which makes it a really strong resource.